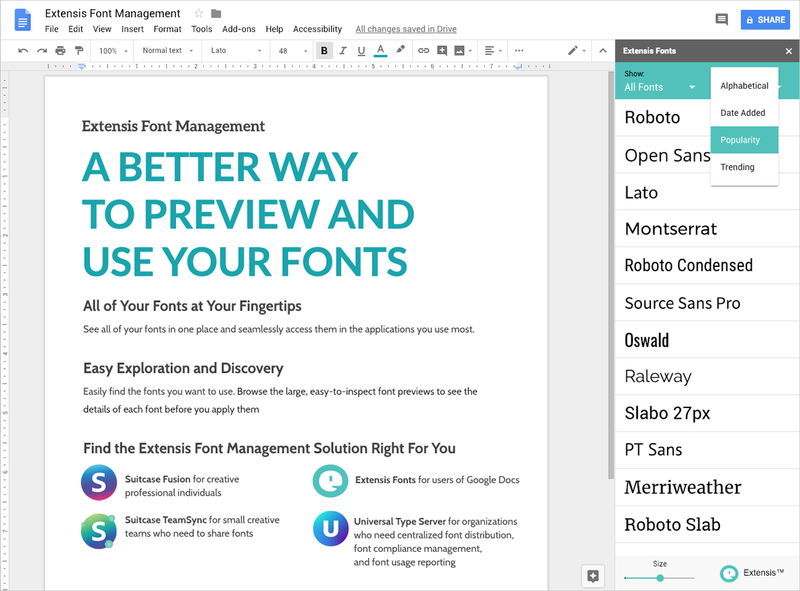 Extensis Fonts for Google Docs gives you a better way to preview and use the hundreds of Google Fonts in Google Docs. See all the fonts in a convenient panel, sort them by style, and get inspired by fonts that are trending. Try different fonts directly in your document too. Simply select your text and click to apply your font instead of returning to the Google Font menu each time. Want to manage all of your fonts, including Google Fonts, in one place? Manage your entire font collection, including Google Fonts, in a single, searchable location—making it easy to search, preview, and use them effectively in your creative projects. Organize, find, and activate fonts in your creative applications with Suitcase Fusion, the font manager trusted by more than 100,000 creative professionals. With your entire collection of fonts in one place and accessible when you need them, you’ll always deliver consistent and accurate font usage, without frustration or wasted time due to missing fonts, font conflicts, or errors.